French toast was a special treat when my brother and I were small. The very name seemed elegant and the stacks of golden bread looked so beautiful and the maple syrup was so heady and rich. Who knew it was as basic as bread dipped in egg and fried? French toast is happy food! So, much to the delight of a certain six-year-old, I took advantage of my first day off of the semester (L’shana tovah to all of those celebrating the new year this week) and made some for breakfast yesterday, with (shock,horror) white sliced bread that I had in the freezer simply because they were giving it away at the Stop & Shop and I couldn’t bear to let it go to waste! I cut off the crusts in a familial reflex (that’s what my parents used to do) but I realized that I didn’t have to! At any rate, the crusts became the bread crumbs for my meatballs later, so no matter. 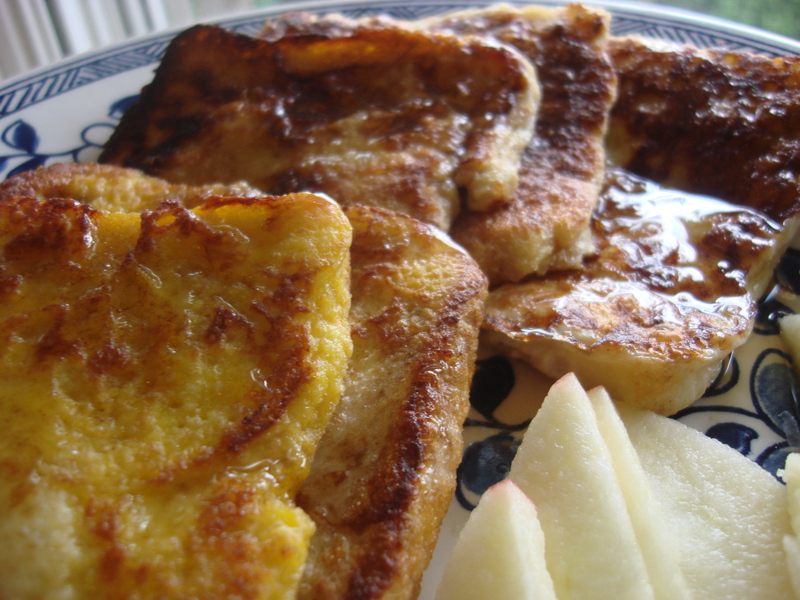 So, basic French toast. An easy treat! Would love to hear how you dress up yours (click here for an cool story on Burning Man French toast). 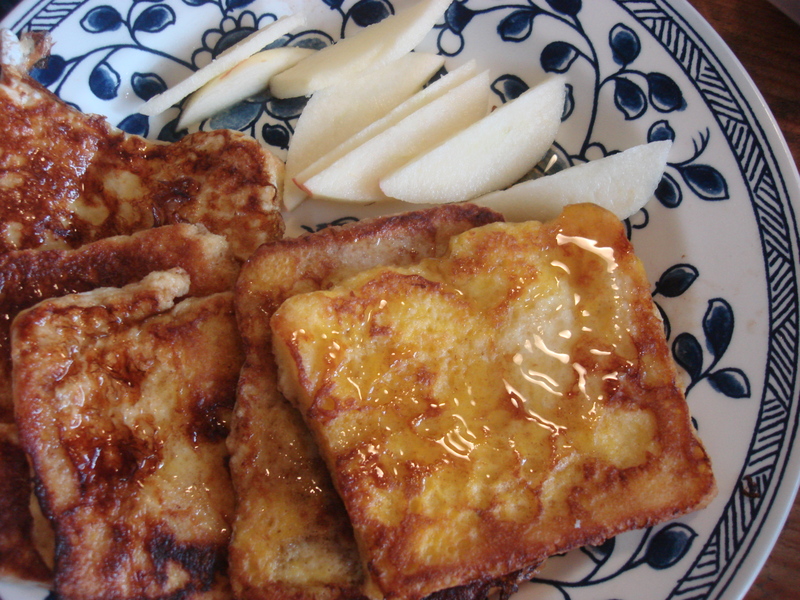 The sliced apples were a big hit with the French toast, dipped judiciously in the maple syrup and cinnamon. Beat the eggs and milk together on plate or bowl that is wide enough to accommodate a slice of bread, but won’t spill over. Dip each slice of bread in the egg mixture just before placing in the skillet (do not soak the bread). Cook about two minutes on each side. Serve with maple syrup and a sprinkle of cinnamon or your favorite topping. Me too! I had forgotten how much…. Same procedures with croissants sliced in half and you can put the expensive brunch restaurants to shame 🙂 Also works to recycle the leftovers (if there are any) into the next day’s school lunch plain or if you want to go a bit further use it as the bread for a peanut butter, banana and honey sandwich. Mmmmmm! Excellent ideas! and I happen to have some mini-croissants in the fridge…oh decadence! I always like to see how others make their French Toast. My mum always added vanilla extract and cinnamon to the eggy milk mixture. Looks delish, want it in my belly! Ooooh, vanilla extract! I will have to remember that for next time…. Thanks, Sharon! I wondered about the cinnamon sugar…can you just make your own? It sounds perfect…. Yep, my ten-year-old mixes her own cinnamon sugar in a tiny recloseable mason jar I gave her. But she keeps her exact recipe a secret! Hahaha….that is very funny! Will have to try it with the little guy.